Until I became friends with Pat Pattillo, the farthest I had ever ventured off shore was chest deep in the Atlantic Ocean. And that was as a kid playing in the surf of Jekyll Island. We became acquainted in 1982, the year before I was asked to participate in Leadership Georgia. Years later, he invited me to join his Middle East Travel Seminar (METS). Besides visiting Syria, Jordan, the Sinai, Israel and Greece, I got a chance to splash in the Mediterranean and float in the Dead Sea. Our plane touched down in Germany, so he introduced me to another part of Europe, too. That same year, 1999, Pat took me in another direction on the globe. He hosted a father-son fishing trip in Costa Rica. We caught some magnificent fish, but I was the one really hooked. Ditto for Eric, our youngest son, who landed a summer job at Hacienda Pinilla. He went back for a second tour of manual labor the next year. By then, the whole family was flying back and forth to Costa Rica. Grandson Wyatt soaked his Pampers in the Pacific when he was barely 6 months old. That’s when we decided to build a beach house there with Bob and Maxine Burton. Today, Pat, Bob and I own a farm in the lush, mountainous, whitewater region of northern Costa Rica, where we grow bananas, grapefruit, oranges, tangerines, guava, papaya, coffee, chickens, geese, ducks, livestock, peacock bass, tilapia and a rich friendship. From our hilltops you can see four volcanoes and Lake Nicaragua. But the best sights are the smiles on kindergarten students in the villages near the farm. Our amigo, Senor Pattillo, had already adopted 40 other schools in Costa Rica, but he couldn’t bear the thought of kindergarten-age children roaming the streets. Bob and I used our partner’s inspiration and blueprint to create three kindergartens that should bear Pat’s name. But he would never have it that way. 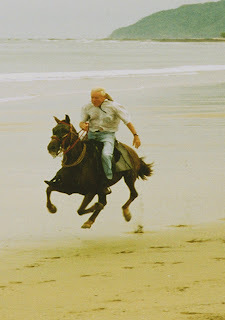 Even at 83 when he climbs into his saddle, Pat’s motto remains: “Ride hard or eat my dust.” A dozen times, I’ve galloped across his ranch, eating his Paso Fino stallion’s dust. Pat’s hard-charging, but humble to a fault. Lucky for me, I met a visionary leader and voracious reader when I met Pat Pattillo by happenstance 27 years ago. After our first encounter, I received a copy of Ferrol Sams’ Run with the Horsemen. Pat’s note was simple—“You’ll enjoy this.” Today, my book shelves are lined with volumes of material from Pat. When I send him a book, he will send me two. And, I read them all, hoping to learn. For me, the luckiest chapter in our relationship is that Pat let me choose him as a mentor. He sits on my imaginary, personal board of directors, but his impact is real. Without Pat Pattillo, my world would have been globally-challenged. And, I certainly wouldn’t be sharing a Pacific sunset with my friends in Leadership Georgia.